Thank you everyone for your encouraging comments on Tuesday's post. I am continually amazed by the kindness of the blogging community. You all rock in my book! 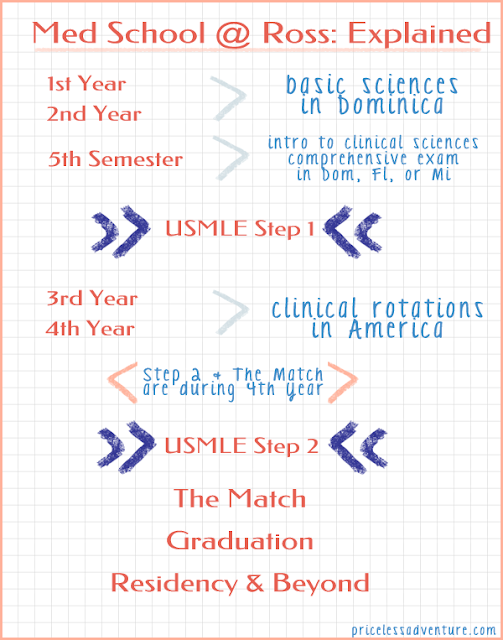 It occurred to me that I should probably explain how this whole international medical school thing works. Attending Ross University is a little different than traditional American schools where you stay in one location for the whole 4 years, but it's similar in a lot of ways too. So where are we in this whole process? 5th semester. It was quite the dilemma deciding where to attend 5th semester, but I am so glad we decided to stay in Dominica. Several friends, including Clare & her husband, decided to stay as well. So for me at least, life has continued as normal. Chris stayed over break & had an extra week to study for the comp while other students were moving from state to state. In his first two weeks at the hospital he has also been able to do several exams on patients & other things that students in Florida or Michigan probably won't have the ability to do because of hospital regulations. Once he gets his Step 1 score back, Ross will assign him to a clinical rotation at an affiliate hospital somewhere in America. We can request a certain hospital or geographical location, but placement depends on a lot of factors. Chances are, we will be on east coast. Anything beyond starting clinical rotations is still a bit fuzzy for me, and too far in the future to worry about. It took me several semesters to wrap my brain around this whole process. Phew. That is quite the process. I give Chris a lot of credit and wish him well on his big scary exam. I'm so glad those days are behind me. Well not med school but I sat for the bar. That was enough for me! Hi, my name is Katie! Caribbean California Michigan with my med school husband & our kitty cat. Life isn't perfect, but it's wonderful!